May 5, 2017 | -by: Kevin George. We live in an era of high-speed digitization and are deluged by the humungous flow of information we encounter every day. With a smartphone in every hand, the situation is even worse. As an email marketer, you need to acquire the skill to STAND OUT from the crowd with email designs that are minimalist. Templates with clean fonts and beautiful designs have a calming effect on the mind of the subscriber, and that’s what is going to help you make a mark in the future. Moreover, a recent study states that around 54% of emails are now opened on mobile. This on-the-go email viewing trend demands easy-to-navigate interfaces and designs that load fast and render well. No one has the patience to scroll through complex, lengthy, or broken emails. Minimalist email design wins on points in this case. The concept of minimalism revolves around stripping away unnecessary clutter to highlight what needs to be highlighted. This practice not only provides a great UX but is also a winner for email marketers. How? A clean, uncluttered design guides the subscriber towards the most important part of the email as far as the marketers are concerned- the CTA. So in a nutshell, a minimalist email is all about elementary typography, brilliantly simple styling and a strong sense of visual hierarchy. And you can also add a GIF to provide an awesome UX. So, if you are convinced that you want to try a minimalist email design in your next campaign, here are a few things you need to know as you don the designer’s hat. White space or negative space makes emails easy to read. It’s not really fair to look at it as ‘blank’ or as the name says- ‘negative’ space, especially not in this case. In a minimalist email, white space balances out the design. Typography needs to be used appropriately in minimalist emails. It’s a good practice to limit the use of fonts; this helps to create a clear, less confusing design. Typography must help to depict your brand’s image. As the emphasis here is on hierarchy, make sure your text is aligned in proper grid in the email framework. It’s best to go with monochromatic schemes but in case you love your emails bright and beautiful, or that is what your brand image demands, you can always use bright colors especially to highlight the important elements. The concept on which minimalist emails are based- ‘less is more’ also applies to the amount of text you use. And to make sure the use of text is limited in your email, you can use something that we actually use every day- icons. Apart from saving space, icons also improve convenience and visually guide subscribers around the email. A minimalist design proves effective if it is structured effectively. You need to organize the elements in the email such that the subscriber clearly gets a sense of visual importance. The reader, at just one glance, should be able to figure out the important portion of the email. When it comes to minimalist design, the first brand that comes to our mind is Apple. In this slick minimalist email from the brand, the bright background highlights the hero image and the offer. As you scroll down, you can see a lot of white space that helps the reader to focus on what is important- the various products suggested to buy as gifts for loved ones during the holiday season. If you had started believing that minimalism has no place for animation, this one is going to prove you wrong. The subtle GIF in the hero image goes perfectly well with the minimalist design of the email. The bright blue color has been balanced out by the white space and highlights the important points in the email quite well. Here’s a welcome email from Harry’s. Minimalist, creative and just awesome! 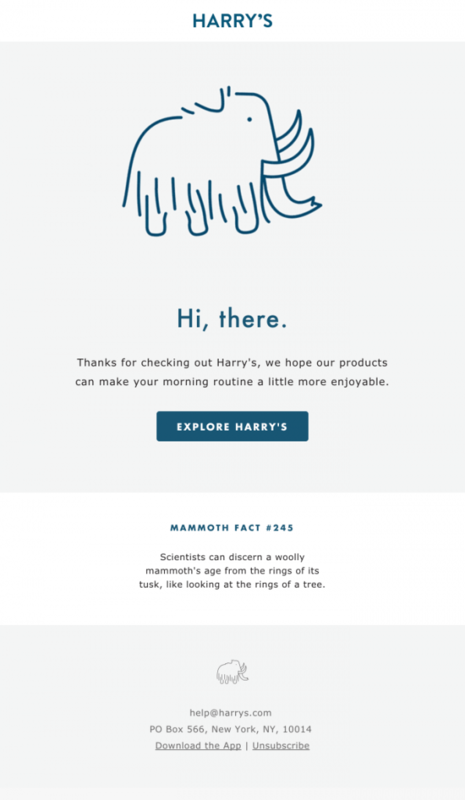 Their favorite mammoth as the hero image, minimal text, CTA prominent & rightly placed, followed by their cool mammoth fact- we really like this one. The online travel company’s nurture email is a minimalist email that has the potential to create maximum impact. With their chipmunk all over the email, the template looks great. Uncluttered navigation in the header, a good balance of text and images in the clean email copy, a bright and prominent CTA, social media links and unsubscribe in place make the email perfect. We’re sharing another welcome email (:p )but we couldn’t help it, it’s really nice. Lyft is a transportation network company and we’re fans of their emails. Take a look at this one. The introduction gives a clear idea about what the brand is about and what kind of emails to expect from them in the future. Bingo! The same CTA above the fold and at the bottom in bright pink is just what it should be like. While they explain ‘how lyft works’ through an image and some text, minimalism is maintained to the core. Here’s an appreciation email for former customers from another brand that is popular for its minimalist emails. They’ve used a simple hero image, good amount of white space is left throughout the copy to make sure the reader’s focus is on the purpose of the email, a discount is offered on an upgrade, and the CTA in yellow stands out. What also catches the eye is the twitter testimonial they have added. Minimalism is a way of thinking. It puts you in a dominant position as you can control the reader’s eye movement as they scroll through your email. Also, fewer the elements in the design, fewer the chances of the design going out of style. It is this timeless potential it carries that makes minimalist emails a vital element of email design.